Learn about color selection and get tips about prints so you can be more confident in choosing quilting fabrics for your next project. The color wheel consists of the 12 colors of the rainbow set in a circular form so their relationships can be easily seen and understood. The most dynamic color combination is complementary, made up of two hues opposite each other on the color wheel. Children typically respond positively to complementary colors. Blue and orange make a bold statement in Citrus Patch Throw. Go to Citrus Patch Throw. A monochromatic color scheme uses a single color and mixes in several shades (adding black) and tints (adding white). This color combination usually creates a tranquil effect because it doesn’t offer much visual diversity. The Flip & Sew Carrot Table Runner, which uses seven shades of orange, is monochromatic. Go to Flip & Sew Carrot Table Runner. Analogous colors are neighbors on the color wheel. Combining them provides a bit of contrast. An analogous color scheme can be cool and soothing or warm and intense, depending on which area of the color wheel you use. The green, blue, and violet create a calm scheme in Fast Flowers Appliqué. Go to Fast Flowers Appliqué. A triadic color scheme -- one using three colors that are evenly spaced on the color wheel -- will have contrast, but because of their relationship on the color wheel, the colors will always be balanced. Abrupt changes from light to dark prints make the Lone Star radiate, while a trio of borders visually contains it. Go to Americana Lone Star. A classic two-color combination includes white and another color, such as blue or red. If you’re feeling adventurous, add accent colors such as green, purple, or yellow. The blue and white prints in medium and light hues in Blue-and-White Pinwheels provide a subtle scrappiness. If the quilt will be a gift, keep in mind the recipient’s favorite colors. The bright colors and novelty fabric are perfect for a child’s quilt. To enhance the illusion that the novelty prints are actually being magnified in I Spy, carefully match background colors to appliqué foundations. Choose a favorite multicolor print and pull colors from it. Avoid the temptation to match the fabrics; just use a merry mix of colors and prints. Floral Nine-Patch uses about 36 different fabrics, including a mix of floral and small-scale prints. Look at books, magazines, photographs, and clothing for color inspiration. Or find a favorite fabric that sparks your interest and work from there. Designer Pat Sloan based the color scheme for Big Block Beauty on a photo of produce at farmer’s market. See the photo that inspired Big Block Beauty. Go to Big Block Beauty. Add white fabric to a design to give the eyes a resting place and add further contrast and clarity. Solid white sashing strips contrast the black-and-white prints in the sashing squares, setting triangles, and border. This provides an unexpected checkerboard look, which creates variance to the soft pastels. Go to 1930s Scrappy Wall Hanging. Include small and medium prints to create diversity in your fabric selection. Little Sawtooth Stars is made of only three colors, but prints of various sizes add variety. Go to Little Sawtooth Stars. Look for fabrics that share hues or themes, but aren’t identical. The outer triangles stand out in Topsy-Turvy Triangles because they’re made of tone-on-tones in a variety of colors. 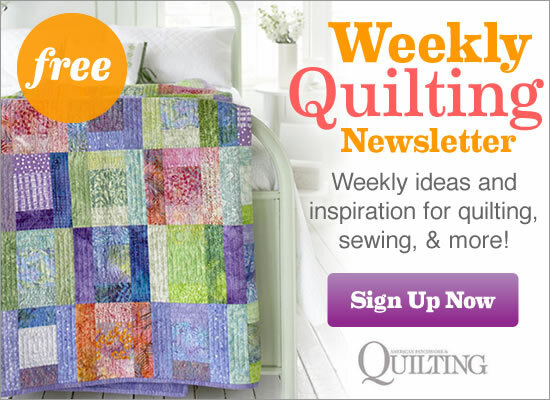 If the color combinations you are considering for a quilt look dull or flat, add green or purple (or both). Delicious sherbet-tone batiks are the foundation for Splashes of Color, but pretty coordinating prints fit right in for a softer touch. Go to Splashes of Color. Imagine the colors of a blooming flower garden—from yellow daises to purple lilacs to strawberry-red roses. Most often colors are tints, which means they use plenty of white. Flirty florals, dainty checks, and the color scheme give Sweet Retreat a romantic feel. Opposites attract attention on this mostly black-and-white batiks throw. A splash of red in the sashing and border enhances the color contrast. Go to Striking Black & White Quilt. Organic colors, such as yellow-green, sage green, yellow-gold, and rusty red, express the Arts and Crafts style. The dark background accentuates the calming colors of Arts and Crafts style in Solid Squares Bed Quilt. Go to Solid Squares Bed Quilt. The colors of Provence include vivid blue, golden yellow, poppy red, burnt orange, and green. The Blue Bouquet Table Topper mimics Country French in both color and design. Go to Blue Bouquet Table Topper. Having a vertical surface on which to lay out fabric choices can help you visualize how they might look in a quilt. For a permanent design wall, cover a foam-core board with flannel, which will hold small pieces in place. You also could use the flannel back of a vinyl tablecloth, rolling it up between projects. To view design and color combination, place a block on a design wall and step back several feet. To further test the color and layout, make color photocopies of the mock block. Use the copies to plan the quilt top. Keep an eye out for patterns that emerge based on how you turn the blocks. Check color placement in adjacent blocks and make sure you like what’s happening. For more tips and resources, visit these Web sites.